I went back and forth whether or not to pick this up when I first saw it announced. The only exposure I ever had to writer John Arcudi was his run on Gen 13 Volume 1, and I just thought it was ok. The premise was intriguing but it wasn’t something I hadn’t read in other forms before. All of this coupled with the fact it was an original graphic novel with a $24.99 cover price, made me very hesitant to invest in it. I’m happy to say it was well worth the risk. Normally, one of the strengths of graphic novels is that they don’t have to rely on cliffhangers every 22 pages like a comic book. The writer has more freedom to structure his story any way he wants. Here, Arcudi chose to do 4 chapters at 50 pages each. It’d be interesting to see if this was originally envisioned as a 4-issue mini series but if it was, I’d find it hard to believe each issue would’ve been 50 pages. But regardless of the original intent, this format works very well here because it allows for cliffhangers and also allows for the passage of time between chapters. Speaking of time, Arcudi’s got an interesting story structure where we follow the 4 main characters in the present while periodically showing flashbacks of significant events in the past between the characters. The main character is Eric Forester. We also follow his brother Hugh, his wife Alma, and Eric’s best friend Sam Knowle. Arcudi does a great job of setting up each of these characters and their various struggles before we even get to the superhero parts of the story. But Arcudi doesn’t give us too much exposition. He gives us just enough up until the point where Eric is bestowed with his powers. From here, the story takes off in a very interesting direction. In the story Eric is a Christian so he believes God has blessed him with these powers. Now I must pause and let you know I am a Christian myself (don’t worry, I’m not going to start preaching from here on), so that’s the perspective I’m coming at this story from. The way Eric takes authority over his powers is almost unbelievable. But Eric is so euphoric about the whole thing, Arucdi lets us feel the elation Eric feels about these new powers. This brings me to Snejbjerg’s art. He does an amazing job throughout the novel but it’s his facial expressions on Eric that really convey how happy Eric is this has happened to him. When you look into Eric’s eyes as he tells Sam everything’s going to be alright and then proceeds to jump out a window and fly into the sky, its Snejbjerg’s art that makes you believe Eric. Of course, from here we follow as Eric becomes a messiah of sorts (even though he outright states he does not compare himself to Jesus Christ). But his godhood loses its impact as he begins to see the corruption of man and how despite his great powers, the corruption still remains. At this point Eric has been simultaneously hurt by society and by those he loves like his brother, Hugh. It is this realization that begins to send him over the edge and where Arucdi takes us to some very dark places. The battles that ensue which Snejbjerg illustrates beautifully are absolutely brutal following these events. Those following Boom Studios’ Irredeemable have gotten a taste of the “superhero gone bad” story but here, there is no holding back. The story becomes heartbreaking as we see Eric driven mad by the idea that humanity is lost and not worth saving. There are even two plot points which I thought were interesting because they are two possible origins to his powers. One is where Eric dreams that he was once a god of another smaller universe who became bored and came to our bigger universe. The other is that Eric’s powers are telekinetic in nature which could either be separate, or go hand in hand with the “god” explanation. In fact, the origins of his powers are never fully explained but that’s ok because in this story they are mainly a catalyst for everything else. By the end, Arucdi is not shoving some religious message down out throats. He is simply giving us a human story in a superhero setting. To see these ordinary people faced with extraordinary circumstances and how they handle it is the strength of this story. I cannot recommend this graphic novel enough. It is a further testament that comics can be a powerful medium to convey meaningful stories that can reach a lot of people. 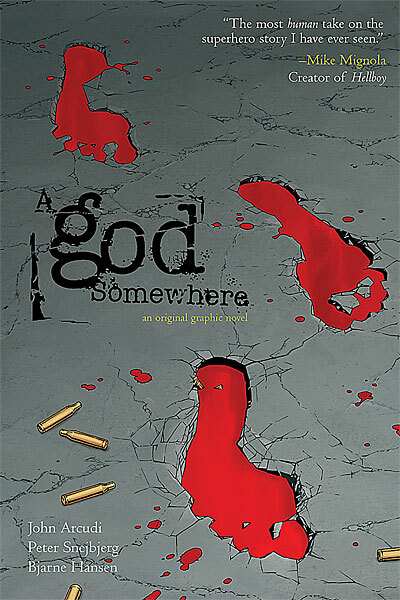 This entry was posted in 2010, A god Somewhere, Creator Owned, Reviews and tagged a god somewhere, bjarne hansen, john arcudi, larry berry, peter snejbjerg, peter tomasi, review, scott peterson, wes abbott. Bookmark the permalink. Great review Joe, I too gave it a 10 out of 10! It was such a quick read, but in a good way, I couldn’t put it down. I can’t wait to re-read this one.